One of the most useful resources for amateur historians, and especially for those without ready access to large libraries, has been the online collection of parliamentary papers on Ireland, the collection known as EPPI: Enhanced British Parliamentary Papers on Ireland. The collection covers the period from 1801 to 1922 and includes over 14000 documents. It was first made available online by the University of Southampton; I seem to recall that, at first, pages had to be saved or printed on foolscap (13 inches by 8 inches) rather than A4, but that changed at some point and the searchability improved; it was possible to read documents online or to save PDFs. And it was all free: users were not even required to register. The DIPPAM project has taken over the maintenance of the EPPI materials from Southampton, enhanced their usability and filled any gaps in the document run, made them cross-searchable with the IED and VMR records, and restored free global access to users. Well, yes, up to a point, Lord Copper. I should say that there is still much to be gained from the EPPI archive and that, as I pay nothing for its use, it is very good value. I would be willing to pay an annual subscription — if that helped to maintain the collection properly. At present, though, it seems to me that the wheels are coming off and the archive is decaying. I have tried to communicate both with EPPI and with Queen’s University Belfast about this; I received replies from neither of them. I should say too that I have no way of assessing how widespread these problems are. It may be that I am unlucky and that all the documents that don’t interest me are working perfectly. Or it may be that software problems are affecting a small number of users including me, but I find problems using two different browsers on two different computers, both of them relatively powerful and using Windows 10. … for the date range 1820 to 1922. EPPI returned no documents. … and it found the Second Report of the Railway Commissioners Appendix B No 7, listing the steamer Garryowen serving Kilrush. Why is it that Google can find things within EPPI that EPPI’s own search engine can’t find? 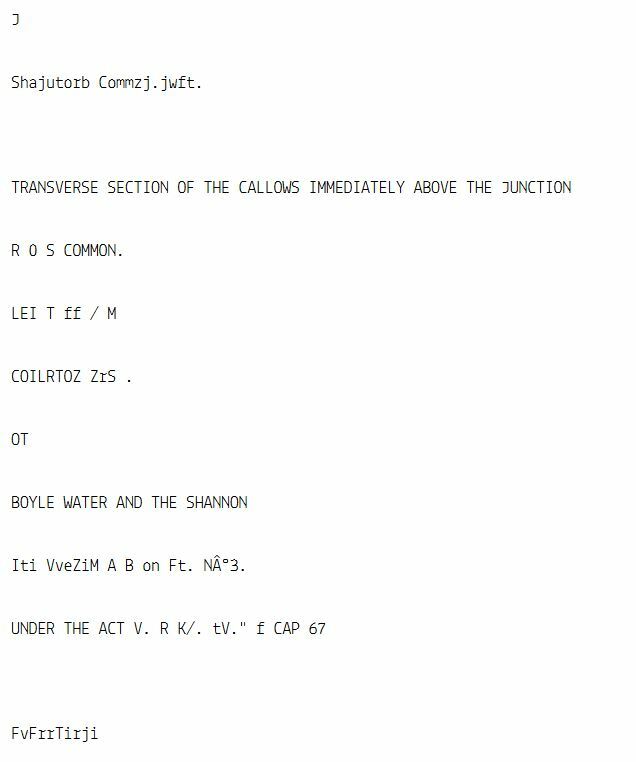 Parts I and II of the Fourth Report of the second set of Shannon Commissioners are available here and here. Or rather that’s where you’ll find the metadata for the documents. Clicking Open Document should provide the scans here and here. In both cases, I get a blank with a small icon at top left; clicking that does nothing. Clicking Scan does nothing. The documents may be there, but they are inaccessible. In both cases I can access the transcripts. That requires me to click Next and then to click Transcript, because the system seems to default to showing the Scan page, even though it is invisible. However, I am reluctant to spend too much of my life reading such poor transcripts. For those and other reasons, I would prefer to download the PDFs. When I try to download Part I of the report, I get A Bill [as amended by the Committee, and on re-commitment] for the better Regulation of Hospitals, Dispensaries, and other Medical Charities in Ireland dated 23 May 1838. Sorry, could not find the download file. Please contact support quoting EPPI document reference 11379. Those are serious problems. I would like them to be fixed. a full-screen option (as on the excellent British Newspaper Archive) to reduce the amount of scrolling required. But those are minor matters. The main problem is that EPPI is no longer reliably making documents available as scans or as PDFs. Something has gone wrong within the archive and, as far as I can see, it’s getting worse rather than better. I accept, though, that I can’t properly assess the state of the entire archive, as my interests are limited to certain topics and periods. I would therefore be glad to hear from others who have recent experience of using EPPI or who have information about what is happening. That includes those running EPPI or DIPPAM and the institutions whose logos appear on the site. This invaluable resource should not be allowed to decay any further. This entry was posted in Historical matters, Ireland, Sources, Uncategorized and tagged Arts and Humanities Research Council, decay, DIPPAM, enhanced parliamentary papers ireland, entropy, EPPI, history, Libraries NI, Mellon Centre for Migration Studies, parliamentary papers, PDF, QUB, Queens University Belfast, scan, search, transcript, University of Southampton, University of Ulster. Bookmark the permalink. You are quite right about this – I have been looking up the Newry and Ulster Canals, and the pdfs lead to the wrong documents. This seems absurd, frnakly, and I wonder to whom researchers can make representations. Such a shame that an excellent free facility should prove so dysfunctional.